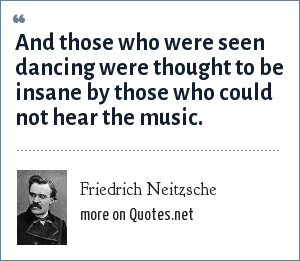 Friedrich Neitzsche: And those who were seen dancing were thought to be insane by those who could not hear the music. "Friedrich Neitzsche Quotes." Quotes.net. STANDS4 LLC, 2019. Web. 24 Apr. 2019. <https://www.quotes.net/quote/73949>.